Children at one of Bristol’s newest primary schools are starting to spread their wings in more ways than one. 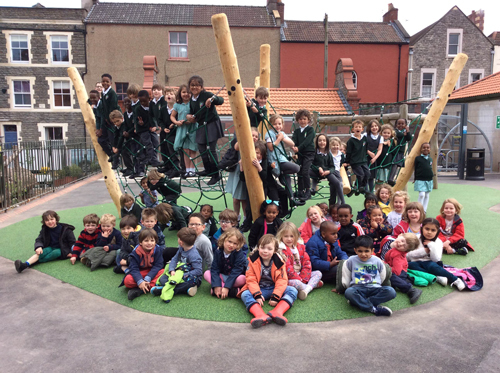 Fairlawn School pupils are enjoying using their new spider net pole climbing frame, which complements the reception play area that opened a year ago. It is part of a continued programme of development of outdoor learning and play space at the school in Montpelier, which currently has pupils aged four to six. An active group of parents is working with school staff and pupils on plans to ‘green’ the site in Fairlawn Road, which once housed Fairfield Grammar School. They raised £1,400 towards the cost of the climbing equipment and they are planning to install more trees, planters and plants. Fairlawn School opened in 2015 in the beautiful Victorian buildings, which have been refurbished and modernised to meet the needs of primary school children. Eventually Fairlawn will have a maximum 420 pupils aged four to 11. Places are still available for September - see the website or contact the school for details. The school has been sharing the site with children from The Dolphin School, but they have moved to their new building behind Colston’s Girls’ School, meaning that Fairlawn children and staff now have access to the full school with its two large halls and playgrounds as well as the stand-alone Reception and Year 1 building. Both schools are among the five primaries in the CGS Trust. Head teacher Julie Molesworth said the children were enjoying having extra space and were enthusiastically using the new climbing equipment. “It is wonderful to see them testing themselves by climbing to height and building their physical strength,” she said.